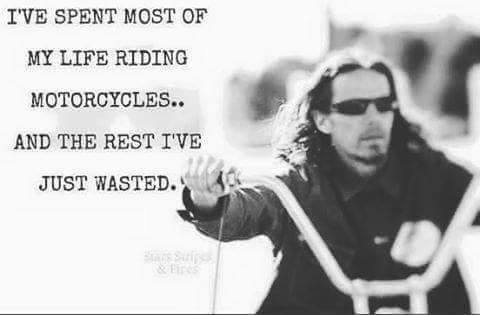 We choose to ride instead of drive for many perfectly rational reasons: speed, acceleration and exhilaration, cornering, getting the full force of the World straight in the mush; avoidance of all that traffic, queues and parking rubbish; the thrill of feeling truly alive. 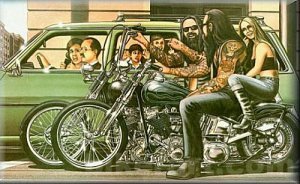 The addition of large amounts of raw danger only enhances Man's greatest ever achievement - 'The Motorcycle'- and makes choosing it as a form of travel and as way of life an inevitability for people of discerning character. Now, shall I walk or shall I ride? 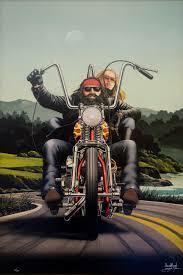 "Ride", Pleasure said: "Walk", Joy replied. My neighbour's idiot son decided to push the parked BMW out of his way only to drop it (at least once but I suspect twice) and cause over £400 worth of damage. He is going to pay up of course but the inconvenience is considerable and I am not happy to say the very least. I am just pleased that my temper did not boil over at the time. I still don't know how I managed that. We were just on our way out for the evening but of course we had to cancel. The headlight surround is broken, the screen is smashed, The luggage is broken, an indicator, a handlebar weight and the clutch lever are all destroyed. Luckily everything is quickly attainable and is already on the way. The Harley is safely stowed away in plastic bags awaiting a bearing transplant on the crank. I hope to get that done by next summer (capital needed). The BMW is running perfectly now that I've got rid of the leak in the oil tank, replaced all the parts scratched in the accident, got the faulty electrics fixed, replaced the water pump components and seals and slapped on a new (and better) battery. Now I find that the radiator that we fixed a while back has gone again. I've got a replacement on the way from the Netherlands. Oh yes, the RH heated handlebar grip has stopped working just as it's started snowing. perfect timing! I hit a patch of black ice the other evening - I lost control of both wheels and was thrown around all over the place but it managed to stay upright. I was sure I was going to hit the ground again but the bike had other ideas. Phew! The engineer from the third party came and inspected the BMW and approved all of the repair costs, so all should be back to how it was as soon as possible. Even my injuries are starting to clear up. In the meantime I've had the chain off and given it a bath in paraffin, replaced the throttle cable, changed the front sprocket, removed the spot lamps (I never used them) and got rid of the ton of gunk that had built up due to the (now completely gone) oil leak. I took her out for a test ride and apart from low pressure in the front tyre everything seemed good. It got some air and then a good warm up on the motorway with no obvious problems. After we get through spending the forthcoming insurance cheque on new parts she'll be in perfect condition again. 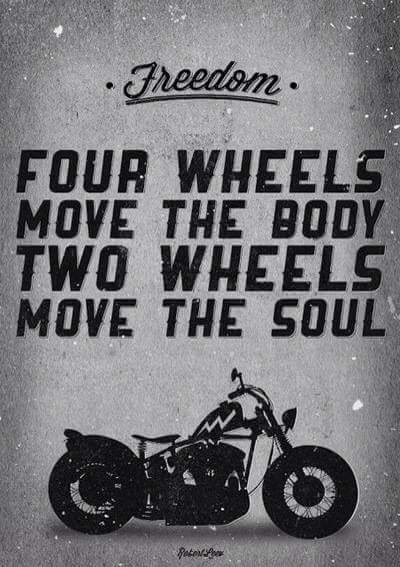 Then hopefully we can spend all of our spare time working on the Harley instead. The BMW and I were involved in a small spill caused by a car driver cutting me off on a roundabout. The bike has a few scratches and a broken indicator and I have a severely bruised and swollen thigh and some road rash. It could have been a lot worse had I actually collided with the car. I managed to throw the bike out of its way but mounted the kerb at a bad angle and the bike and I got thrown violently to the floor. No bouncing or skidding - just Splat! Aint it bloomin' typical? I'd just got the bike running perfectly and looking good and ready for our Summer/Autumn holiday. One of the parts that got scratched was replaced just a couple of weeks ago. 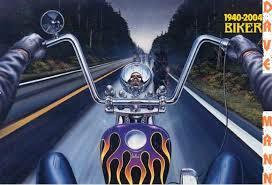 Anyway, I have a witness and the third party admitted fault so the bike should be looking good again very soon. My leg looks anything but pretty though! We now have another bike in the garage, namely a Honda NC750 which has been supplied by the insurers for me to use until mine is repaired. The Harley has been apart and put back together again and it is still bad. We've stripped it down again and this time we are going to have the crank out and check every last bit of the engine. During the summer I had been generously given the loan of an F650GS BMW to play on by our friend Kev (Slug) and it has taken Gill and I all over the British Isles recently. It's a 650cc single cylinder bike with mono-shock rear suspension, fuel injection, ABS and most importantly for the winter - heated handlebar grips. It is very comfortable, fun to ride, it sticks to the road like marmite to a blanket, is extremely reliable and is the perfect weapon to use on expeditions of all kinds. It was designed with the Paris-Dakar Race in mind and won it on it's first outing. I have decided to buy it as a much-needed second bike and it is now known as Thunderbird 2. 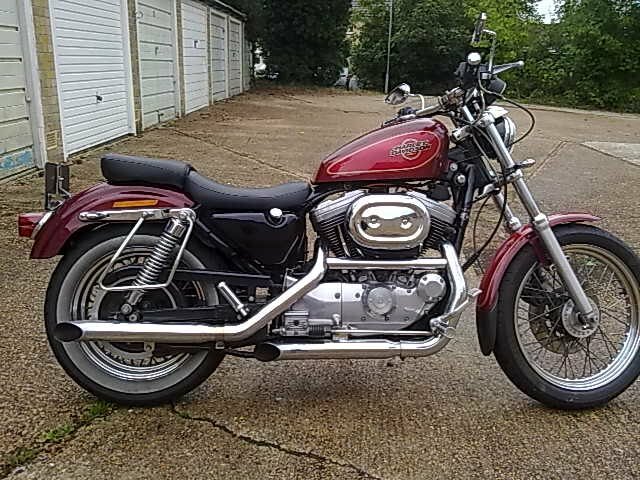 The intention is to have the Sportster back on the road by the Summer and to use the old lady for slightly less demanding outings in the better weather. We love our Harley and we don't want to kill it completely with short journeys so TBII will act as our main runabout from now on. The main focus for improvement to our new bike will be the addition of lockable panniers and a security system. 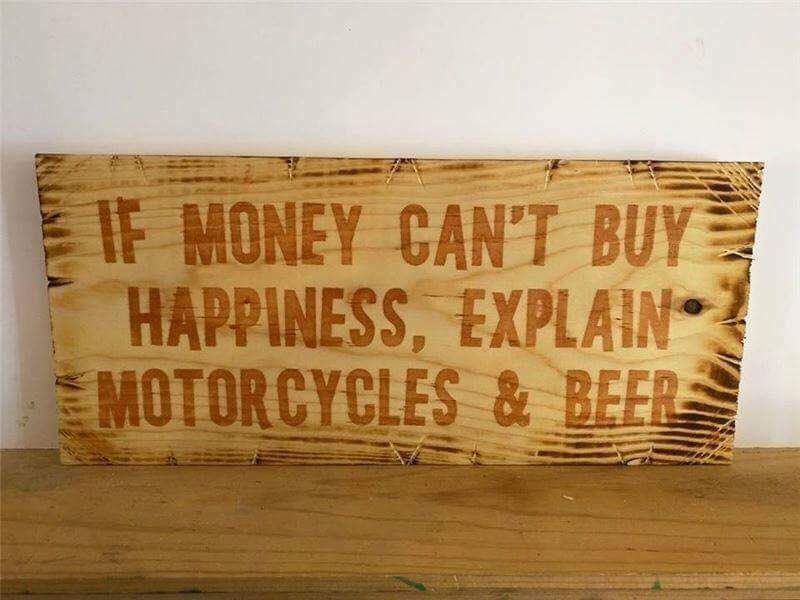 Oh the joys of owning a classic motorcycle! After all of that work I did recently to spruce the old girl up we took ourselves off out to the other side of Petersfield for a bloomin' good wander about. On the way home as we were thundering between the walls of Petworth she started to make a horrible growling, knocking noise. I instantly realised it was more than likely a bearing complaining. I decided to just get the bike home but my comment of “The engine's knackered” to my pillion passenger did not go down at all well. There was no point in hanging about – the next day I started stripping the engine down and in less than 8 hours I had her down to the crankcases. Luckily I have some great friends who are talented and knowledgeable engineers. Between us we found that the engine was, in general, in very good shape. The surface of the bores were a bit shiny, which is due to a patina that builds up over time, so that got honed off using a carborundum tool in a lathe. When carefully done this process allows the oil to stick better to the surface which in turn prevents wear. Every engine part was cleaned and checked and all gaskets, O rings and disturbed seals were replaced. The ancient oil tank and the unopened crankcase were flushed out with paraffin thus allowing the sludge of 21 years to finally be removed. The fuel tank filter was cleaned out and a new oil filter fitted. The barrels got a fresh coat of paint, the heads were polished and the valves and pistons were cleaned up like new. Every bolt was torqued down properly and the electrics were cleaned and checked over. In all the bike has had a complete make over. Gill has also now learnt how an internal combustion engine of the old school actually works and found the entire process fascinating. “So what was wrong with the poor thing?” I hear you asking. Well, it turns out that it was the clutch bearing. It had actually been turning round and round in its housing rather than spinning on the ball bearings like a bearing's supposed to do. This had caused heat and this heat had worn the bearing out. The bearing had seized but had not broken up although it was now loose in its housing where it ought to be tight. Luckily removing the clutch is a quick and painless operation and Kev (God bless his smelly cotton socks) is now going to mill 20 thousands of an inch (5 fag papers of thickness) out of the housing and insert a tolerance ring between the housing and another new bearing. This packing-out with a ring of corrugated steel will hold the bearing in place once and for all (we hope). We should know by Wednesday and if it works I will need to run the engine in again. The week after we are off to ride it a thousand miles around England. Optimistic or what! Wish us luck. The clutch bearing that's causing all the stress. I had the front end off to fit a new front brake disc and fitted protective rubber boots to the forks at the same time. These keep the road poo out of my fork seals and they look really good. Replacement fork oil finished making the front end feel as good as it now looks. Old skool rubber handlebar grips were added and they are so much better than the old ones that were on the bike when I got it. These ones absorb the vibrations and they even seem to stay warmer too. More importantly my hands now actually grip instead of sliding off. The drive belt snapped again! This time I stayed philosophical instead of angry. There is an ongoing fault which seems to be caused by the belt being out of line no matter what I do. If I adjust the wheel alignment then the belt rubs on the tyre. There is a large spacer behind the front drive sprocket/pulley which looks like it is worn down a bit so a new one is on the way. Hopefully that will sort it out. We are only talking a couple of mm here. When I took the exhaust off to get access to the belt it fell apart... a bit. The rear silencer has had it and the front header pipe was completely worn out with holes appearing everywhere. A used but good condition front header pipe is on the way from Indiana, new exhaust gaskets and drive belt from Scotland and exhaust snap rings from Jersey but I still have to decide on the pipes I want to buy. I don't want them too loud as I start her up at 5.30am every day. I certainly don't want them too quiet though! The rear light and rear indicators are being upgraded to LED and combined. This is taking a lot of customising 'arts & crafts' to achieve, so watch this space. Electrics are out of my comfort zone and my pudgy fingers are next to useless at anything creative but I'm hoping the final effect will look cool (if it works). In all, this is costing quite a bit of dosh so it's lucky I have got a cushy little job at the moment that gives me Fridays off to tinker. I expect to be back on the road for around April 23rd-ish but I am not rushing. I want the drive belt problem solved permanently and there are still a few things I want to make good. The whole bike needs a proper deep clean and the barrels need repainting, the number plate is being replaced and a new throttle cable needs to go on, jobs which could take close on a week. The bike has to be working and looking perfect for the visit to see little sis and the TT races in June and the Lake District soon afterwards. The charging system has been perfect thank goodness. The bike now starts far better, the lights are brighter and the engine feels like it is firing stronger. The front brake is working incredibly well despite the disc being on its last legs. A new one is in the post as we speak. As is another side-stand spring: they snap so often that I am getting one in readiness. Also coming is a new ignition switch which has nearly given up the ghost. 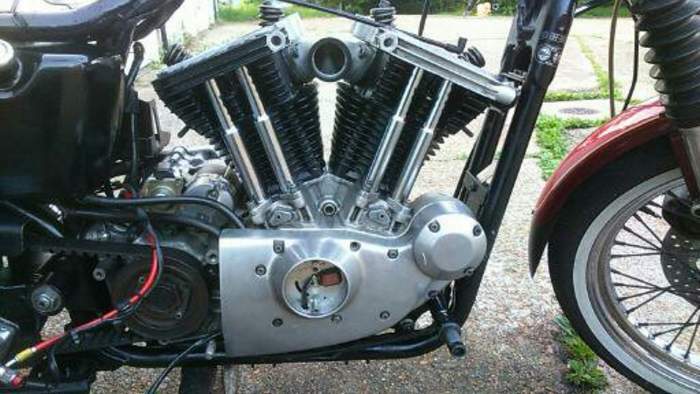 The plan is to relocate that to the battery box and start tidying up the front end of the bike. Great news: We paid for the IOM ferry the other day so we are going to the island for TT race week. We are so excited and can't wait. On top of all of the bikes and the racing the island in June looks fantastic, so we'll get some superb hiking in too. Ok, it's obvious that the electrical problem has not gone away as the battery is still going flat every few days. I don't have a multi-meter and I haven't used one to diagnose a fault before so my mate Slug is coming round Thursday to give me a quick lesson and the bike a good checking out. Luckily it is still tipping it down constantly and I have no spare cash so the bike can linger in the garage a while until this charging malarkey has gone away for good. At the moment the thought is that there is a short somewhere or the voltage regulator may be on the fritz. Update: It's the regulator. £85 for a new one and it's on it's way! Battery box all cleaned up and painted. 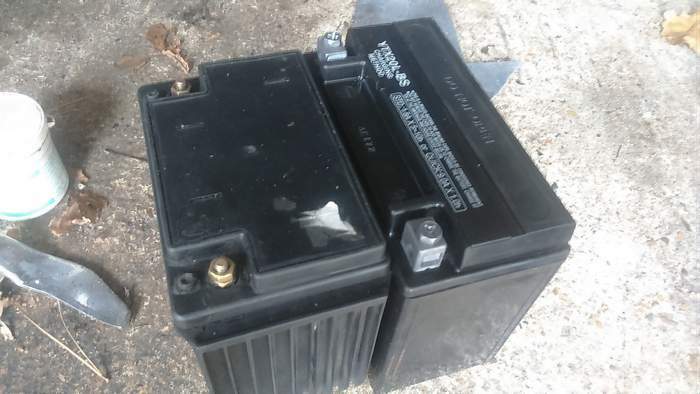 I had two dealers both supply me with the wrong battery over Christmas (were they celebrating too much) so we were left bikeless over the festivities. It didn't matter too much as Mother Nature seems to be giving this little island an extended bathtime anyway. The North of England is completely submerged and drifting away and down here in the South, well let's just say we don't think there will be a hosepipe ban this year! 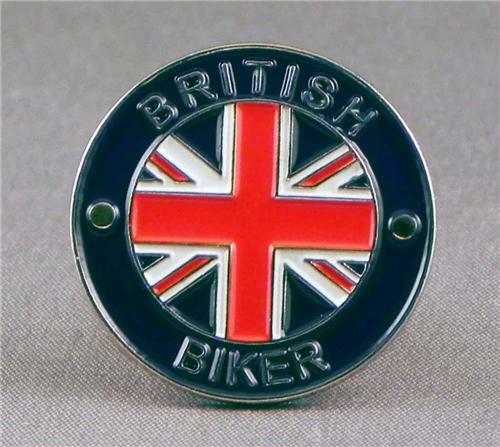 Today however, with the correct battery charged up and connected and after a barrage of multimeter tests the bike was certified electrical problem free. The old battery had been getting sicker and sicker over the past few months and finally gave up the ghost. It was helped to the coffin by a small short in the wire of the newly-attached horn that some pudgy-fingered imbecile had put on recently. Back on the road for the first day of the year - surely an omen for a good year to come. Bike still running perfectly although front master cylinder has been playing up a bit. All down to the old girl hitting the deck at 1 mph on a slippery drive in Snowdonia last month. The brake lever took a bash and now it's not returning properly when pulled. The big problem I have right now is that my battery has completely and utterly kicked the bucket. Bikey no go with no elastic trickery! September 2015 - After getting the poor old girl puffing, wheezing and spilling oil all the way to the Lakes and back. The new air filter needed some major alterations to get it working like the real thing, rather than like the cheap knock-off that it is. It now works perfectly and best of all it replaces the huge ugly thing that Harley had put on there. However, to take advantage of the improved air flow the carburettor needed some urgent surgery too. The brass idle/mixture screw was stuck fast in it's thread and the head had become mashed up from trying to get it out, so I ordered a new part and took the whole carb over to Dave. We first tried the traditional drill/extractor method of removal but the bloomin' extractor broke off in the screw! We had no alternative but to cut the flange down and grab hold of the stuck screw with some mole grips and twist it out. The new mixture screw has a long thread on it, so the missing section of flange will not matter too much. The new screw also has a thumbscrew on the end of it to make adjustment of the fuel/air mixing ratio far easier. At the same time the carb was thoroughly cleaned inside and out and stainless steel Allen bolts and washers were fitted throughout. I also had a severe oil leak from the front cylinder rocker box which got new gaskets, lashings of slicone and some shiny new bolts thrown at until it promised to stop! After a bit of carb tuning I can report that the bike now goes like pooh through a goose. There is more power and range in every gear and the acceleration has improved drastically. What's more, the acceleration does not appear to stop and seems to be intent on reaching somewhere around 130mph before stopping, I wouldn't know for sure as I keep running out of road. In all the bike is a real pleasure to ride and it feels extremely healthy. It's also had a good bubble bath and is all shiny for a change. With new; belt, tyres, forks, carb and air intake one would hope that the bike will be fully operational and healthy for some time to come. 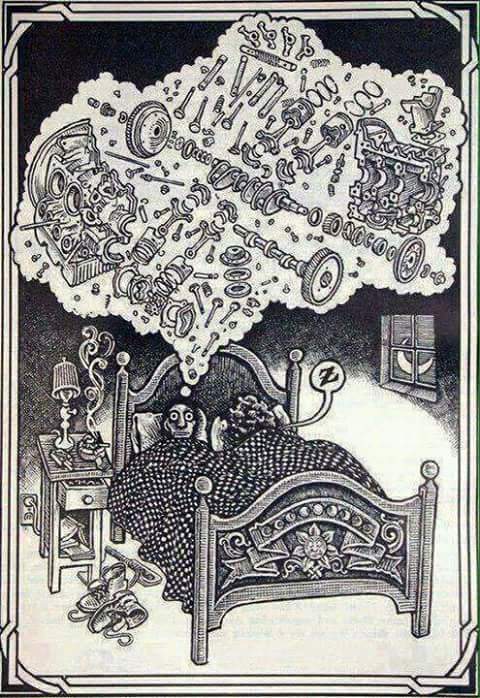 I have however found that with a 21 year old bike things do not always pan out like that. I suppose it keeps me busy and out of trouble though, so it's all money well spent. New brass mixture screw and stainless steel Allen bolts throughout. Chinese knock-off air filter. After some British alteration it now works perfectly. With just a few more funds in the coffers the time is ripe to update all sorts of things. Firstly, a second-hand pair of forks off Ebay for £50 replace my old ones that were still misting out fork oil. New white-walled rear tyre, brake pads front and rear and plugs. Best of all a complete air intake is on the way from our oriental friends which will make the bike look, breathe and perform even better. 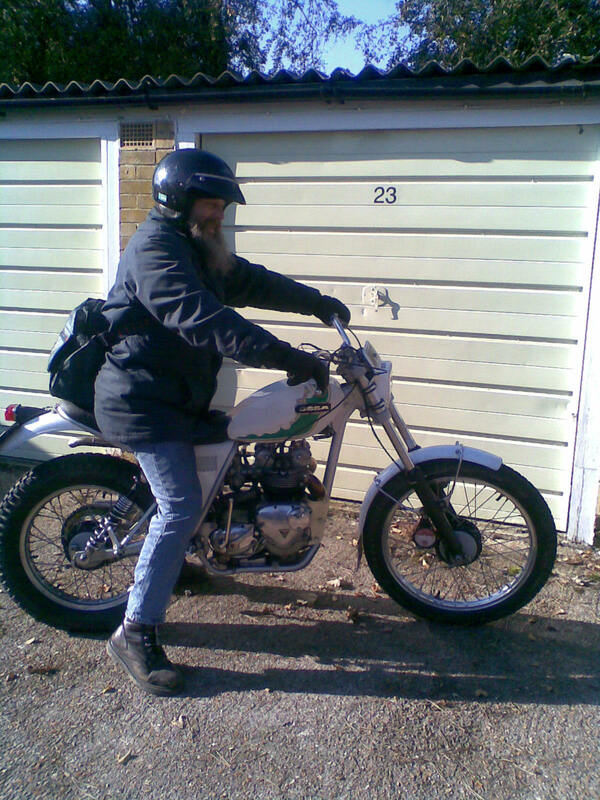 In all the bike is in great shape and the engine is perfect (touch wood) although one of the next bits to buy is a primary chain which I have been promising to get the bike since the day I bought it. Beaky done the MOT last week and he had no comments to make other than the handlebars were a bit 'mobile' (fixed) and that the pipes were noisy. They will not be getting fixed! Decided to take the bike off the road for a while and do a lot of work on it. First I removed the huge speedo and tacho dials and rewired things a bit. This has given the bike a much better look and a cleaner front end. Talking about front end I renovated the forks completely and repositioned and repaired the front indicators. I went out of my comfort zone and did some spraying of the frame and swingarm and cleaned the heads of black paint but repainted the barrels with engine paint. I gave the whole bike a complete deep clean, new plugs and HT leads, new oils etc. It was tidied up in all sorts of ways and the luggage is now completely renovated. I even wired us up for 'elastic-trickery' so that we can charge our phones as we're travelling. The front brake decided to play up after it was disconnected and as well as fitting a repair kit to the front master cylinder it also needed honing out by 'Spanner', whose help I could not do without whenever I come up against a brick wall (quite often). 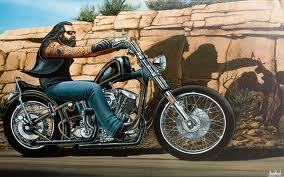 Dave has been hitting Harleys with hammers for 50 years and there aint nothing on a hog he can't fix as long as he can take a good run up at it and use the right curses! Bike update - 44,000 miles. Just back from the second Lake District run for the bike this year. It's also been used virtually everyday in all weathers for the past three years or so and just like our old Fatboy (RIP) it loves it. Tyres are in great condition, brakes feel great, electrics are all perfect and the engine just purrs. There was an issue with the old girl spitting off her carburettor when hot. A missing/vapourised spacer in the air filter was replaced by a nice big slab of rubber and she doesn't do it anymore. There's a light oil weep from the front rocker cover due to a dodgy gasket (I did that!). It's not under engine pressure and it's just a drop or two a day, so it's just enough to keep the top of the engine from getting rusty. On the return leg of the last trip there appeared a slight oil leak from the clutch inspection plate gasket. It's not losing much and again it's down to some podgy-fingered idiot breaking things. Suspension is all new and good but the roads are terrible in Sussex, so what can you do? A small, round, air intake will make it look more retro straight away and will enhance the view of the upper engine and tank. -Replacement tubular style oil tank. -Get rid of the indicators and have them built into the mirrors and tail light instead. That should get it looking closer to how I want it. Stripped back and simpler. To make it look simpler and cheaper costs loads of cash so this is all just a wish list. Instead I will be buying; tyres, oil, the odd desperately-needed part here and there, not to mention trying to replace the 10 year-old, oft abused and oft repaired panniers that we stuff full of everything from shopping bags to wet rucksacks. 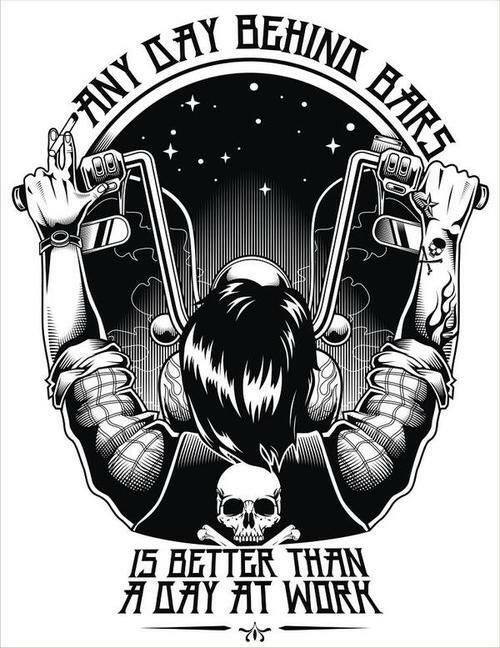 Everyone always asks (without fail) if the 16" bars make my arms hurt. I'm at the point where I'm expecting them to hurt now, as everyone must be right and I must be wrong, right? Sorry, a vast amount of experimental data appears to agree with me. After 300 miles me arse sometimes hurts like billio but me arms are just fine thank you very much. In between bouts of writing the above I have once again snapped a sidestand spring and have had to resort to the dangling bungee option. Doh! Fitted the new belt (£145) and it only took a couple of hours and went on easily: I didn't even have to take the wheel off. After a small test ride around the garages there was a terrible rattle. After much heartache and gnashing of teeth I realised it wasn't coming from the engine after all but was actually the front brake! The well-named 'ant-rattle spring' has broken. This does not affect the working of the brake but the noise does drive you mad. In the USA this part costs less than £2.50 but here in the UK it's a tenner! Now all the bike needs is a right good polish (free) and a new rear tyre (another £120). A broken rear drive belt has kept us off the road over Christmas which with the permanent storms, floods and potholes is no real loss at all. Instead we have been taking a long break indoors. The new belt is about £170 and will be here soon. 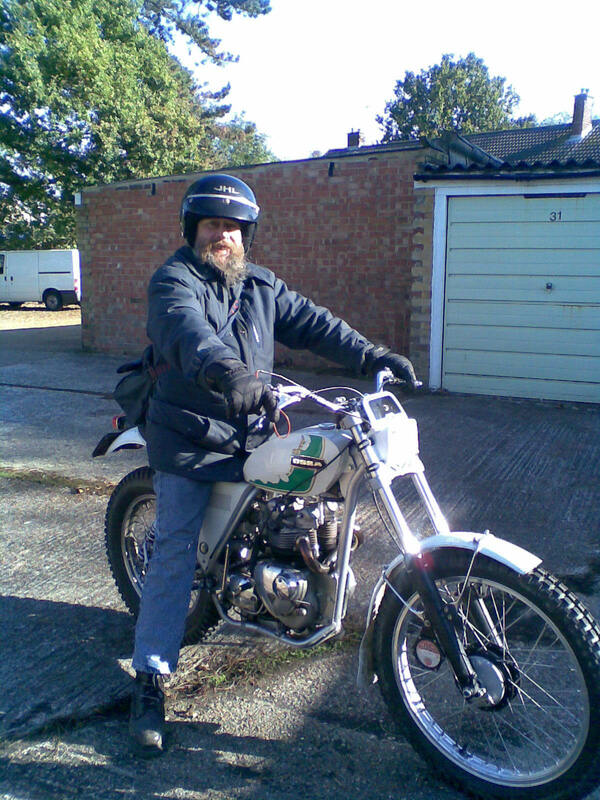 November 2013 - Sportster update. Apart from having a rear tyre that's nearing its final days the bike is going really well. The worn-out air filter assembly still causes the carburettor to fall off now and then but I've now got the running repair down to about 5 minutes. A new air filter is £250. The carb itself is tuned up pretty well and just needs a couple of minor tweeks to get it set up perfectly. I'll wait until I get the air filter sorted before I go about it. For now it's more than adequate. The saddlebags on the other hand are completely worn out and we now have three options; renovate the old ones completely, make our own or buy some new ones. The committee is still pondering that one! It's an urgent problem though as we need the luggage to carry our stuff on 'expotitions'. 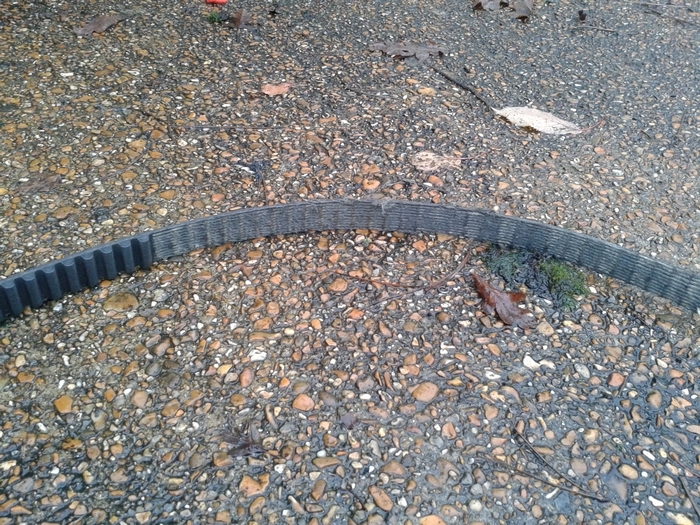 I've heard a few 'chirrups' from the drive belt in the past few days which usually indicates that all is not well and I'm concerned about affording a new belt (£100) if it fails. The engine is running beautifully though and it just sings as we motor down the A272, if you can call 3000 rpm at 70mph singing! It's probably a baritone or more likely Tuvan throat singing. The rear brake had been misbehaving somewhat and eventually became stuck fully on. That completely finished off the brake disc and the calliper, both of which are probably 18 years old. Money is very tight however and it has taken a miraculous intervention by the government (via a tax rebate) to finally pay for the new parts. Gill even got a new set of pillion pegs to replace the mole grips that she's been using for one lately! New calliper, brake disc and pillion pegs. Serious running problems, a burst brake line and loads of snow meant that the bike was off the road for nearly 6 weeks. The carburettor needed stripping down and cleaning, the brakes needed renovating and it also got a much needed full service. It's now back in great condition and ready for the summer. 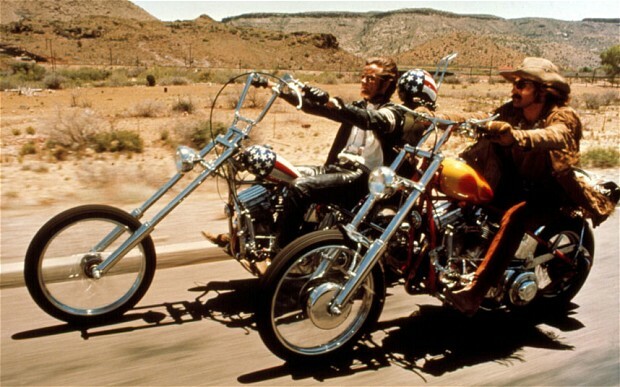 We are going to need some new saddlebags soon though, our old ones are falling to bits now. We were both on holiday so we took quick jaunt down to Coldwaltham Brooks to watch the Barn Owl. 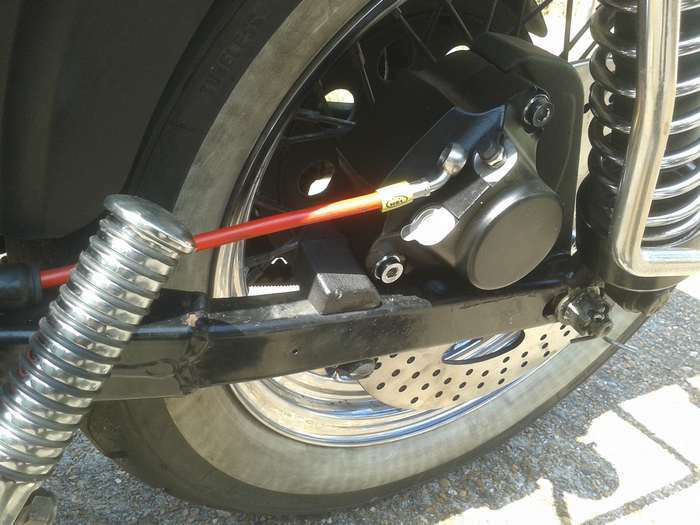 I'd noticed some wear on the drive belt before we left and it was preying on my mind, mostly because they are expensive and also because on other Harleys they are a pain in the posterior to fit. On departing the brooks I casually mentioned to Gill that we might possibly break down on the way home. I don't think she took it seriously but pretty soon I became convinced I was going to be proved right. By the time we got to Crawley we were suffering badly and were spitting teeth out everywhere. Really we should have stopped but I figured that all that was going to happen was the belt would break or lose so many teeth that it would be unable to run on the pulleys due to being so gummy! If you could choose, where wouldn't you want to break down? Where would be one of the worst places? What about on a roundabout: one of the busiest in Crawley... at rush hour? If you're going to do something, do it so everyone else can join in too, that's what I say! 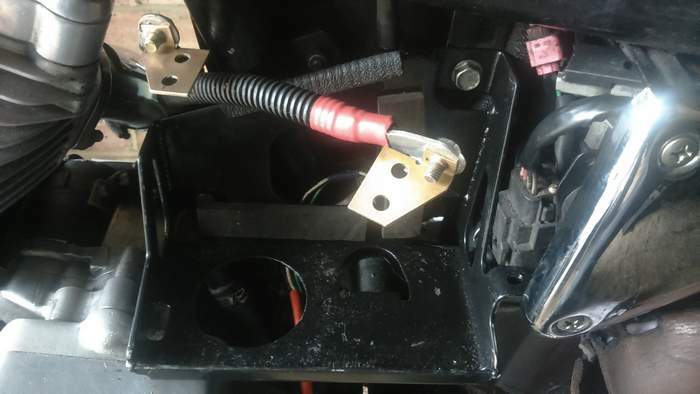 The simple addition of a pair of raised handlebars actually takes a lot of work - the wires for all of the electrics have to be extended, 2 extended throttle cables need to be replaced along with the brake line and clutch cable. With the help of Spanner we got it all done with as little fuss as possible. The six inch risers needed to be replaced with stock short ones and so I used the ones that came off of our late-lamented Fatboy. The new seat is off being re-padded with memory foam as it was too thin for comfort. A couple of weeks ago the front and rear suspension were upgraded as well, so the bike is now getting to just where we want it. We've done about 7000 miles on the Sporty now and we're loving it. It's been good and reliable - a dodgy circuit to the rear light (fixed), a broken spring in the primary chain tensioner (fixed) and a puncture have been the only problems and they were no real problem at all. The rear suspension is ok for one-up riding but is wholly inadequate for two people plus luggage, so the shocks will be replaced as soon as possible. 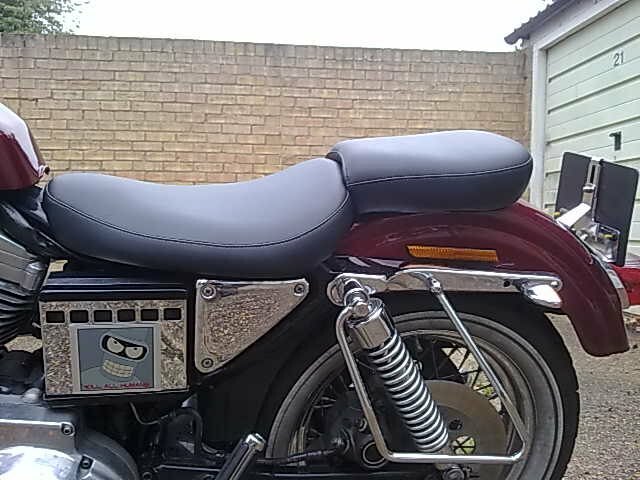 The seat on the bike was a one-piece affair with a very small amount of thought given to the comfort of the pillion rider, so I got a cheap old seat off of Ebay and gave it to Dave at P&D Custom. He converted that into a comfy seat for two that also quickly converts into a retro-style solo seat. 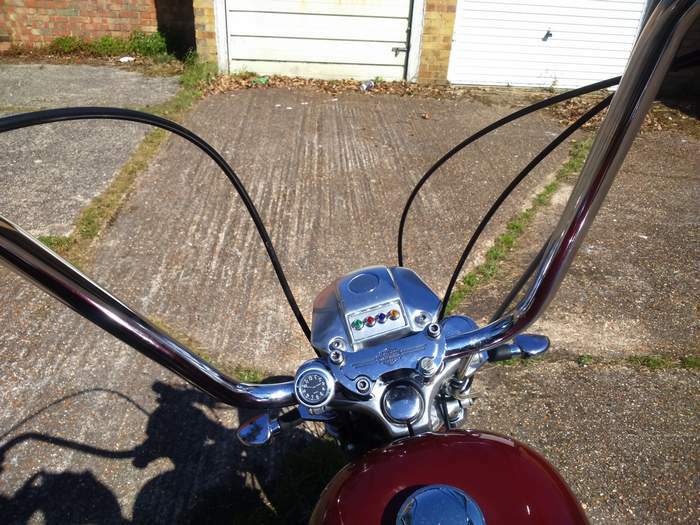 My seat is ok and will be even more comfortable when I get the handlebars raised up to where I want them: the important question was, would Madam approve too? She loves it - 10/10, a much comfier and safer feeling ride and she can see now over the top of my head again and get a better view. Phew, what a result! Spanner and I went up to Blacks Bikeshop in Ormskirk, Lancashire today to see a bike I found for sale on Ebay. 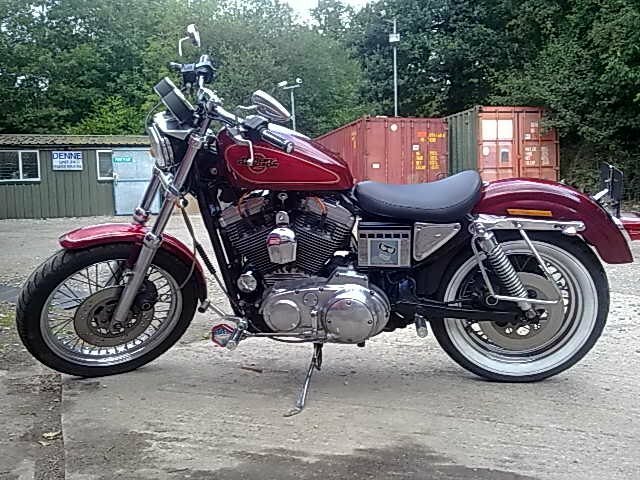 It's a totally clean and lovingly-maintained 1995 XLH 1200 Sportster with only 13000 miles on the clock. Everything about it was as new and seeing as I do about 13000 in a year, as far as I'm concerned, the bike is a year old. I rode it the 250 miles home, most of the way in the pouring rain and it didn't miss a beat. That was probably the first time it had been ridden in the wet and it loved it (me too). 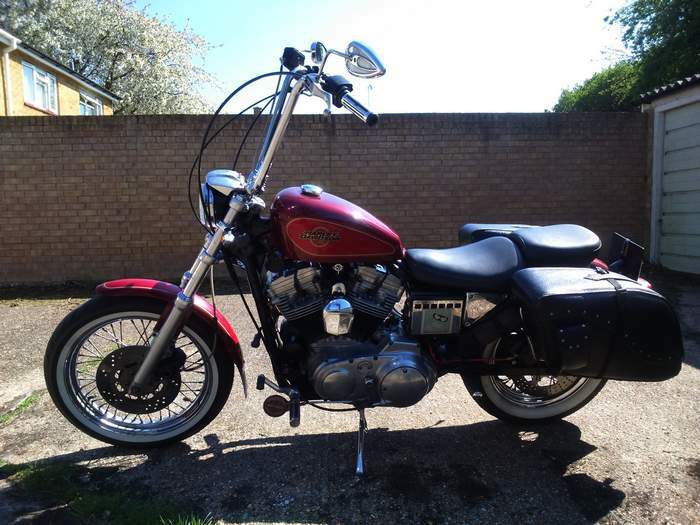 It's not the model of Harley I originally wanted and is what is often referred to as a 'baby harley' (1200 cc is no baby, trust me), but seeing as my savings had dwindled considerably I was left with no choice but to get as best as I could with what remained of my money. I think that I've achieved that and we are both overjoyed with our new baby. Best of all, despite spending most of its life in the north of England, our new bike was originally sold (born) from Shaw Harley Davidson. So it's a SUSSEX Harley and we've brought it home to where it belongs. It's going to need some small changes over the next few weeks: the handlebars first, as the riding position is slightly wrong for me (aching bum or what! ), plus we'll have to get it set up to take our saddlebags and luggage rack so that we're ready for some expeditions. But even without all that, we have freedom from public transport at last - woooo hoo! 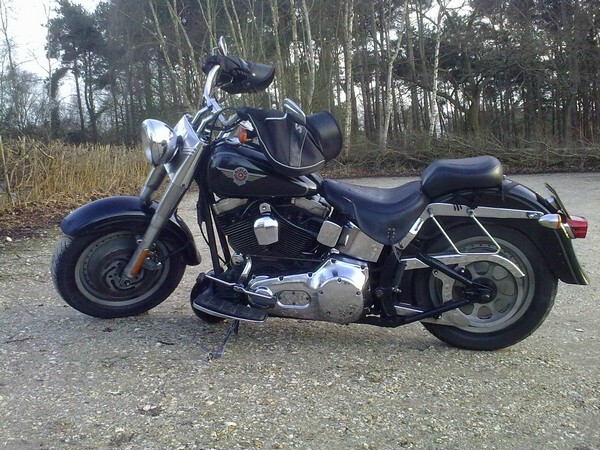 Our lovely, old Harley Fatboy has been written-off by the engineers for the insurance company. Apart from all of the visible damage to the bike the frame had also bent at the neck. There's nothing that can be done and we're both completely devastated at losing our faithful old bike. Life goes on though and we're now searching hard for a replacement, so if you know of an FLSTFI Fatboy for sale, then give us a shout. In the meantime we've been given a courtesy bike (above) by the insurance company while the claim is being sorted out. It's a Suzuki Bandit GSF 1250 GT and we're not keen on it at all. 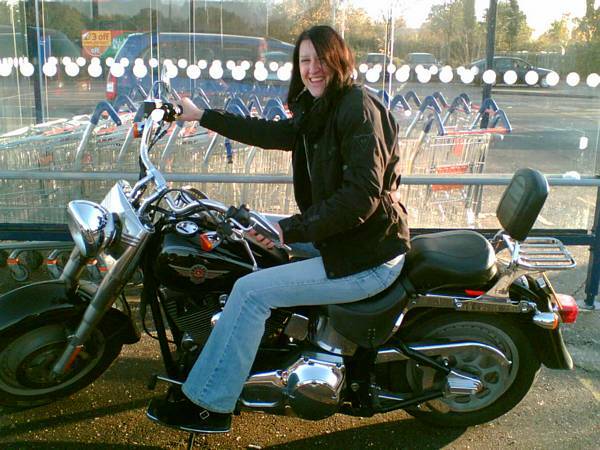 Our old bike was a 2004 Harley Davidson FLSTFI 'Fatboy'. We got it brand new on 18th February 2004 and we'd done 90,490 incident free miles on it before the accident. It was used every day of the year, in all weathers and virtually never let us down. We still miss it like mad. In the winter we cover our bikes in a protectant. This is a sticky, smelly goo that comes out of a can. 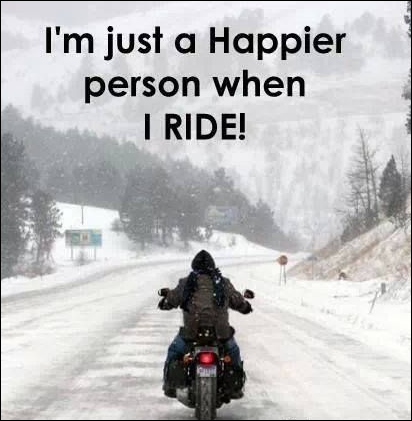 It stops the bike from rusting when there's salt on the roads. It works well but it takes the rest of the year to get it all off again. In the winter the bike ends up looking like it's made out of muck, as everything sticks to the protectant. IT LOOKS GREAT! 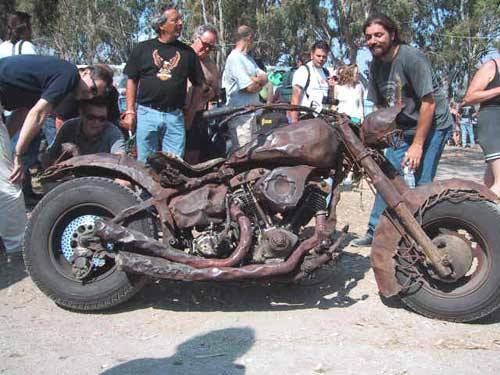 With a little care and a lot of hard work, this is what our bike will look like soon. 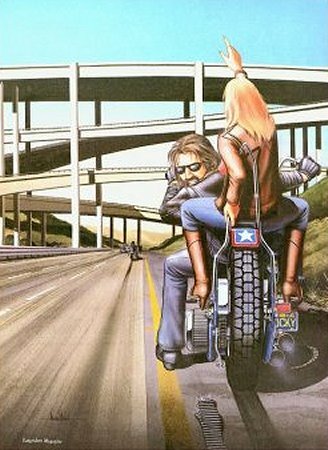 Gill loves being a pillion passenger. She gets a good view from sitting up and behind me. Probably a better view than me sometimes, especially over hedges. I'm very lucky that she doesn't want to get a car.